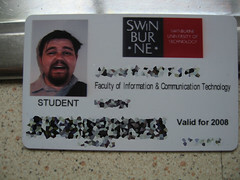 Today I went in to Uni to get my New Student Card. When I got to the point where they were taking my photo, I was told to look down the barrel of the camera. I did, and when I heard her click the button on the computer I started moving away… Just as she said to “wait for the flash”. So I ducked back, just in time to get this as a result. She asked if I wanted a different photo, but that I didn’t have to, there are no requirements of Not Smiling like in Passport and Drivers Licenses. I stuck with the photo, and I think I may have made her day.